Repairing the failed part: This means exactly that however, this option is only applicable when everything else has been inspected and determined that repairing just the failed component will be a solid repair. Replacing with a used unit: On the surface this may sound like the most economical choice but when you take into account all the necessary things that must be done, things like transferring accessories air conditioning, power steering components replacing seals and gaskets, belts hoses etc… When it’s all said and done sometimes this choice becomes very close to overhauling or even replacing with a rebuilt unit. 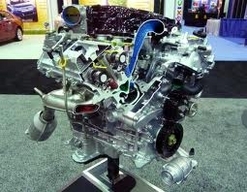 Rebuilt unit: There are many companies that offer rebuilt engines. However finding the right one for your application that has a proven track record of reliability all at an affordable price is the challenge with this choice. Remanufactured unit: This may be the closes choice to a brand new engine. These engines take up were the rebuilding ones left off. Rather than replacing just the wearing parts, remanufactured units typically have all moving parts replaced or machined to manufacturer’s specifications leaving just the shell of the engine block and cylinder head(s) this is the superior choice of all. However cost is what generally prohibits people from making this choice.